The imperatives and expectations created by the internet will force change in institutions, no matter how resistant they are. There is simply too much pressure from the ground up for institutions to retain 20th century forms. Media companies are classic examples of organizations that have to respond to the new digital realities. All institutions will have to start listening more intently to their stakeholders. “Molecular democracy” and “Long Tail economics” are asserting themselves. Institutions that redefine their relationship with their stakeholders will be the ones that succeed. Markets will drive that process in the commercial realm. Still, there will be tensions as stakeholders know more and more about the organizations that are trying to serve them. The authority and governing structure of large organizations – public and private alike – are being profoundly changed in ways that are moving power from some traditional centers to others and this is a disruptive thing. Institutions may embrace “network structures” even if that does not much change their relationship with their constituents. A struggle will unfold between traditional organizations and networks as to which is the best way to organize people, knowledge, and commercial activity. Change in organizations will occur in phases in response to pressures wrought by new technology. Businesses will be first movers and governments will lag. 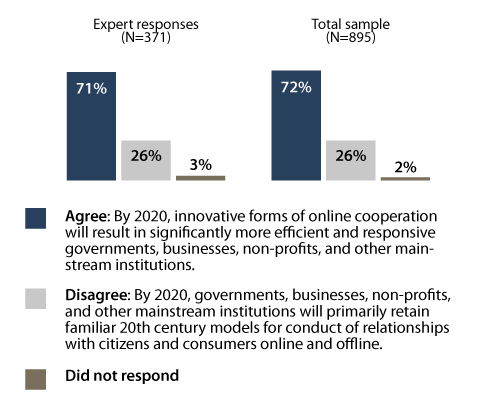 Part of the reason is that government agencies might be under less pressure to change because their interactions with citizens are not as frequent or prolonged as business firms’ interactions. Government agencies are cumbersome and resistant to change. The pace of progress towards openness and responsiveness will be slower than anyone would hope. In fact, the process might work in the opposite direction from the one implied by the questions here. Governments might embrace digital technologies because they will allow agencies to have more control over their interactions with stakeholders. Institutional change surely will come, often starting at the periphery. There are market opportunities in offering services related to responsiveness, yet, big, traditional organizations such as school systems will be slow to adapt. Organizations might move towards more responsiveness and efficiency, but those moves will be limited by their natural tendency to control information and deny citizens and customers full awareness of what organizations know. One of the big barriers to change is that people in bureaucracies do not necessarily want to be found and want to be responsive, no matter how much their organizations say otherwise. Institutions might keep their 20th century form, but their performance will be better thanks to technology adoption. Institutional change is not the issue. People will use the internet and cell phones to create organizational structures to solve their problems and if old-school organizations cannot adapt, they will wither. “’Significantly more efficient and responsive’ organizations and institutions? Hardly. But there will be some important developments, particularly involving government and non-profits. The Howard Dean presidential campaign showed the potential promise offered by the internet. Hundreds of thousands (if not more) of formerly disenfranchised voters were able to actually connect with a campaign in a remarkable digital, grass roots movement. Sadly and predictably, the usual political machines have since jumped in with typical control mentalities and co-opted the promise shown by the Dean phenomenon. Even so, movements like MoveOn.org, Lawrence Lessig’s ChangeCongress and others will continue to mobilize the electorate in new ways – as long as they avoid the taint of big political money. The Web’s ability to help non-profits is only beginning to develop in such movements as Kiva and Donorschoose. They will remain more interesting and effective than commercial or political/governmental endeavors precisely because non-profits are non-profit. Which brings us to the commercial world. Don’t expect anything to improve or change the relationships between corporations and consumers. As long as profit trumps all other responsibilities of corporations, their internet presence will always be self-serving and duplicitous.” – Dave Rogers, web designer and developer at Yahoo! Institutional life will become more intense in an always-connected world. The impact on responsiveness and efficiency is still to be determined. Institutions can have the best of intentions, but many are already overwhelmed with the volume of new interactions they have with their customers and constituents. One major change will affect the relationship between amateurs and experts. Those with institutional backing and authority will not necessarily be able to wield the power they once enjoyed in the face of empowered amateurs. There will be new opportunities for people to interact with and influence all kinds of institutions, but only the “time wealthy” will really have the ability to engage the institutions. The digital divide will especially matter in this realm. The major change will come when ‘digital natives’ are in control of institutions. The timeline of change will stretch out longer than this question suggests. Efficiency and responsiveness are not the same thing. This challenge to traditional institutions is a real test for the direction of the internet’s impact. The release of more public data could be the most significant driver of change – and local activity might be the leading edge. Citizens will expect to have direct access to the data and information they need. Organizational embrace of technology solutions can sometimes be a step backwards. Think: telephone trees. At the end of the day, humans are still in charge of institutions and their attitudes and behaviors will dictate how those organizations are run. The positives and negatives of technological change do battle. Will the result be a triumph of networking or more-concentrated, centralized control?